With such a narrow list of food likes, the options for eating out were slim. On the rare night that my parents did not muster the energy to cook or when my brother and I were alone with my dad and he didn’t whip up his famous breakfast for dinner special, we would hop in the car and head down the road to The Italian Village. We did not go expecting fine dining, though as kids we did not distinguish between good and bad pasta anyway. We loved the excitement of being out for dinner, the predictability of the menu that was full of things we knew we liked, and the paper place mats waiting to be turned into works of art with the complementary crayons provided. For my part, the tempting voice of lasagna always called out to me, but I found I liked the idea of it more than the reality. In my mind, lasagna should be a comforting bite of al dente pasta, creamy cheese, and flavorful sauce. I occasionally took the leap and ordered The Italian Village’s version, but more often than not I was disappointed with the goopy mess of floppy noodles, stringy cheese, and bland sauce. As a result, I usually defaulted to the boring choice of ravioli with marinara sauce. Fast forward more than 15 years, and, until recently, I still hadn’t attempted homemade lasagna. When a version of the recipe adapted below caught my eye, I decided to take it on. This lasagna is a twist on the original – instead of marinara I used bechamel sauce and instead of plain cheese I mixed fresh sage, rosemary, and lemon and lime zest into ricotta, mozzarella, and parmesan. The sweetness of the butternut squash provides a satisfying contrast with the spicy, bitter broccoli rabe. It was a lot of work and many steps, but the result was worth it. I would certainly make it again to feed a crowd, grown-up breaditarians included. *I am happy to report that my brother grew up to be a 6 foot tall, thriving young man with an incredibly healthy diet of fruits, vegetables, lean meats, and whole grains we should all aim to emulate. Who would have thought. The best part of this recipe is that its component parts can be made ahead and refrigerated until use – you can even put together the whole lasagna and pop it in the oven the next day. 1. Prepare the squash. Preheat the oven to 400 degrees. Toss squash slices in olive oil, salt, and pepper, and roast until tender (about 15 minutes). 2. 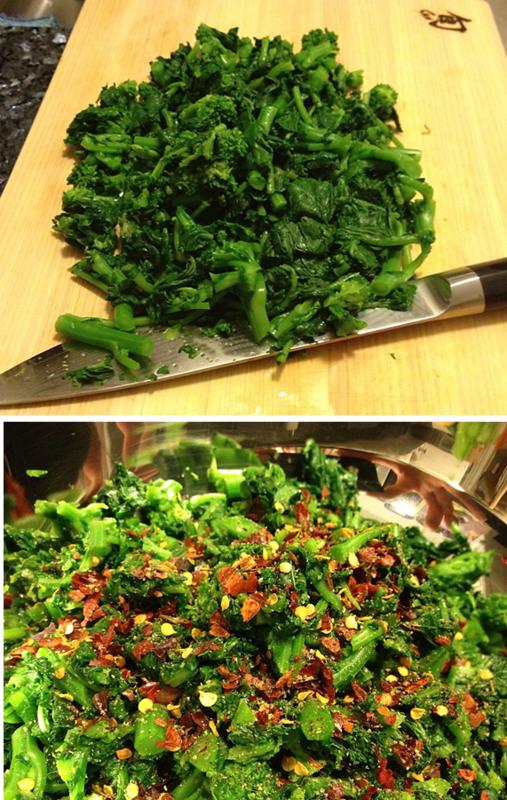 Prepare the broccoli rabe. Blanche broccoli in boiling water for 2-3 minutes. Remove and shower with cold water to stop cooking. Coarsely chop and transfer to a big bowl. Mix with red pepper flakes, salt, and pepper. 3. Cook the noodles. Boil lasagna noodles until just al dente (~8 minutes). Spread noodles on dish towel or parchment-lined baking sheet until ready for use. 4. Prepare the cheese. 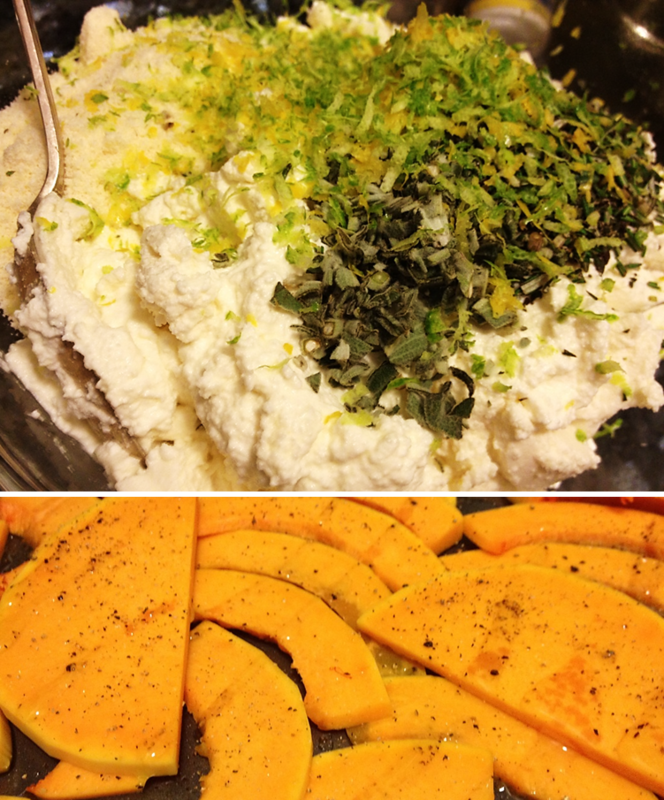 Mix cheeses, fresh herbs, and lemon and lime zest in a bowl. 5. Make the bechamel sauce. Melt butter in a large saucepan over medium heat. Add flour and stir continuously until thickened and golden in color (3-6 minutes depending on size of pan and level of heat). Add the milk 1/2 cup at a time, stirring throughout as it thickens. Once all milk is added, season with nutmeg and salt and let simmer for ~10 minutes. Remove from heat. 6. Assemble the lasagna. (Preheat oven to 350 degrees if cooking immediately.) In a 13x9x2 inch baking dish, layer bechamel sauce, noodles, cheese, squash, and broccoli. Repeat for a total of 3 layers, ending with noodles on top. Coat top noodles with remaining bechamel sauce and grated parmesan. Bake lasagna until bubbly and starting to brown, about 45 minutes. I’ve made lasagna before, but palate gal’s has been by far the best. It’s delicious, and when that top layer of sauce and parmesan browns a bit it is just beautiful!